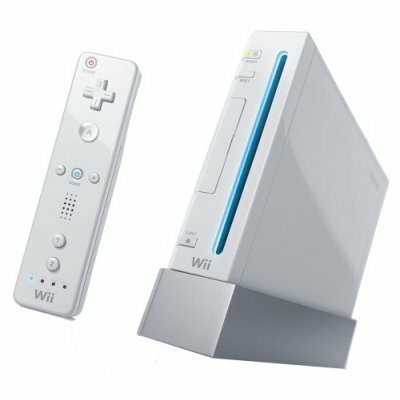 Tonight is the night when the dreams of millions of video game fans come true - it's the long awaited launch of the interesting named Nintendo Wii. We've not been keeping as up to date as we should on the Wii, probably because we're surrounded by consoles we've used for ten minutes and then forgotten about, but if you're not a big gaming fan then you should know a little bit about this as no-one is going to shut up about it for months. Plus, if you don't know what it is it's just going to get confusing if people start asking if you'd "like a go with my wii" isn't it? The Wii is Nintendo's follow up console to the ill-fated Gamecube. It's white and shiny, which is always good when convincing people with disposable incomes to buy things, and it has a really nice blue light which makes us get all excited. The most eye-opening thing about the Wii though is the fact that the controller isn't a big phallic joystick, nor a controller with about 17 buttons making it impossible to know what does what - instead it's a remote control that you wave about, no doubt designed to baffle the parentals when they're unable to make it turn on the television. Who needs the gym eh? After selling out in Japan and Northern America almost instantly upon release, UK fans have been booking presales for months and now tonight is the night. HMV 150 Oxford Street will be hosting the launch event and anyone is free to show up. Don't expect to be able to buy a console though, unless you're on the presale list or one of the first 200 in the queue, which we expect is already brimming over. The store will re-open at 11pm to launch the console at midnight and you'll be able to take on sporting celebrities Pat Cash, Jodie Kidd, Ian Wright and Ricky Hatton in a game of Wii Sports. Bosses, prepare for your gaming friendly employees to ring in sick tomorrow. And make sure you take a break and come online to let us know what it's like.